& Fit Children for Life! If your kid is overweight, you simply need to feed him less and have him run around after dinner, right? Even though this “eat less, exercise more” paradigm has proven a total failure for adults, this flawed logic is now applied to kids—and no surprise, it’s not working. In the past 30 years, childhood obesity has more than doubled in children and quadrupled in adolescents. Obese youth are more likely to have cardiovascular disease, high cholesterol, high blood pressure, and diabetes. On the emotional front, things are even worse. The plight of overweight children and their families is devastating, and something must be done to stop this downward spiral. Spurred to action after hearing countless stories from overweight kids who were bullied and shamed on a daily basis, weight loss authority, Jon Gabriel, along with pediatric obesity specialist, Patrica A. Ronald Riba, MD, partnered to write an extremely timely new book: Fit Kids Revolution: The Parent’s Diet-Free Guide to Raising Healthy Children. 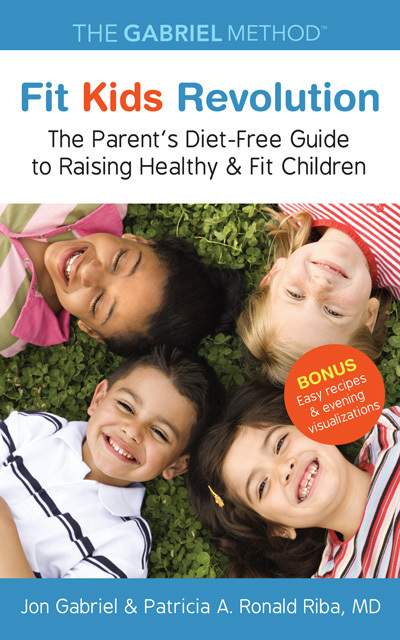 Get 10 Free Healthy Recipes!